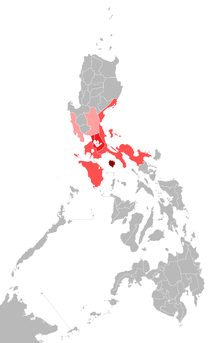 Predominantly Tagalog-speakin regions in the Philippines. The colour-schemes represent the 4 dialect zones o the leid: Northren, Central, Soothren, an Marinduque The majority o residents in Camarines Norte an Camarines Sur speak Bikol as thair first leid but thir provinces nonetheless hae signeeficant Tagalog minorities. In addeetion, Tagalog is uised as a seicont leid athort the Philippines. Tagalog is an Austronesien leid o the Philippines. ↑ Nordhoff, Sebastian; Hammarström, Harald; Forkel, Robert; Haspelmath, Martin, eds. (2013). "Tagalogic". Glottolog. Leipzig: Max Planck Institute for Evolutionary Anthropology. ↑ Nordhoff, Sebastian; Hammarström, Harald; Forkel, Robert; Haspelmath, Martin, eds. (2013). "Tagalog/Filipino". Glottolog. Leipzig: Max Planck Institute for Evolutionary Anthropology. This page wis last eeditit on 8 Julie 2016, at 04:28.